Important: this investigation was done against xRM Portals Community Edition (i.e. the on-prem version of CRM Portal). The findings may or may not apply to CRM Portal on cloud that is hosted by Microsoft. References to source code refer to the source code of XRM Portals Community Edition, which can be downloaded from https://github.com/Adoxio/xRM-Portals-Community-Edition). 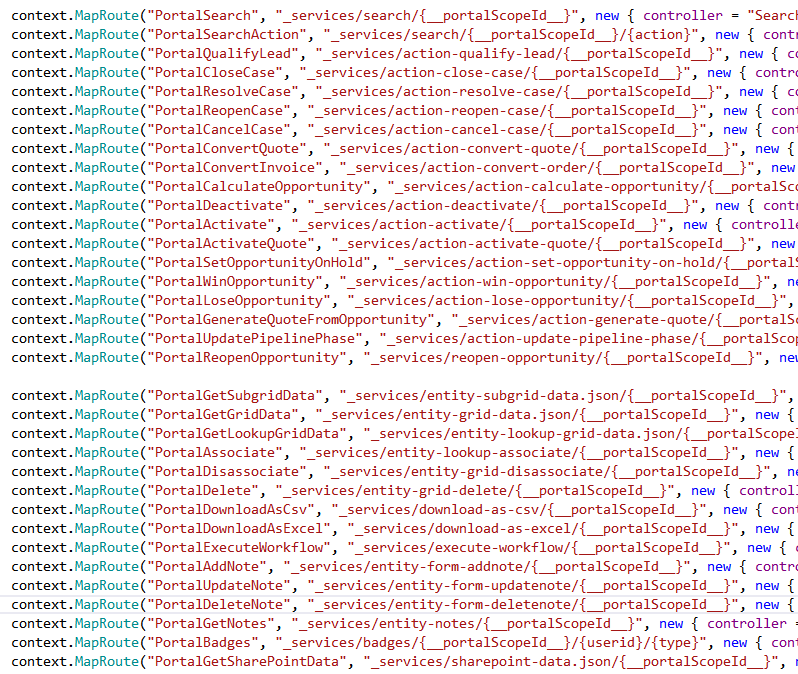 This particular service route maps to the Delete method of the class Site.Areas.Portal.Controllers.EntityGridController, which is defined in the file \Areas\Portal\Controllers\EntityGridController.cs of the Portal project. The route mapping of the ‘delete list item’ service is defined in the RegisterArea method of the Site.Areas.Portal.PortalAreaRegistration class, which is defined in the file \Areas\Portal\PortalAreaRegistration.cs of the Portal project. There is a slight complication in invoking this service from JS, and that is it has anti-forgery enabled. This means that our requests to the service must contain a __RequestVerificationToken header with a valid token value. ajaxSafePost is essentially a wrapper around jQuery’s ajax method, and is responsible for ensuring the request contains a valid __RequestVerificationToken header before sending it off to the server. This method returns a promise object as it may relies on an async request to retrieve the token (more details later). Below is an example of how you could use the ajaxSafePost method to invoke the ‘delete list item’ service. How does ajaxSafePost retrieve the token? This method first attempts to retrieve the token from an input field on the page. If one is not found, it makes an async request to the URL [portalUrl]/_layout/tokenhtml to request a token. Strictly speaking, since it’s not documented (as far as I’m aware), I’d say this is unsupported. Since the service is fairly loosely coupled to our code however, switching over to a custom service when the need arises should not incur much overhead. You however need to make good judgement based on your own scenario. The built-in services are hidden gems that could really streamline your customisation efforts. There are built-in support facilities that make invoking them relatively easy. You however need to consider your scenario carefully as these are not documented, and therefore may change without notice. I have not had a chance to test whether they also work on CRM Portal online. That is a to-do for the near future. In my current project we have recently upgraded to 7.0.26.0 of ADXStudio. Weird thing is , I started getting this error “The required anti-forgery form field “__RequestVerificationToken” is not present.” . The page is rendering the hidden antiforgerytoken. I tired couple of things but, everything went in vain. Could you please help me out in resolving it. Is this on an OOTB page and entity list? Or are you trying to use the built-in service as described in this post? Hi Bernado, I’m having a problem with the __RequestVerificationToken. We were using very 7.0.0.18 and I manually upgrade the package to 7.0.0.24. I have an Entity List with two Entity form to insert and edit the record. I created a web template and rewrite to a blank aspx page. When I run the portal with a clean build of 7.0.0.24 I can see the Entity List and create and edit. When I run the portal that I upgrade from 7.0.0.18, it displays the entity list headers but not the line details. It this error message “The required anti-forgery form field “__RequestVerificationToken” is not present”. Any help on how to fix it? Is it possible to share your code on how you use datatables with an entity list dataset? Nevermind, I solve my problem. I need to update the entity-*.js files in the js folder.